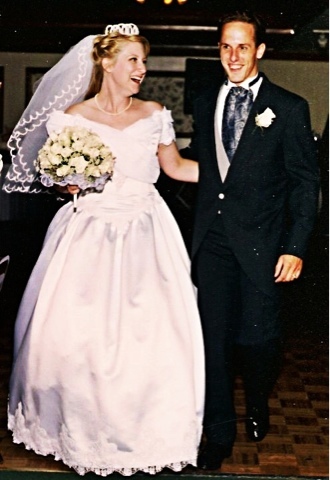 On June 22, 1996 I said I do and life has never been the same! Today we celebrate sixteen years of married life. Last year we celebrated apart - Michael was in Macau and I was back in Los Angeles packing up our life in preparation for our move to Asia. This year we're together, but we'll spend a good portion of it packing once again, as tomorrow we get the keys to our new flat here in Shanghai, where we'll (hopefully) spend the next three years. Our address may change frequently, but our love for each other has remained constant through the years. How grateful I am to have such an amazing person to share all these great adventures with! Here's to many more years... and adventures! Happy anniversary. That picture is great. Will your hair ever be that long again?